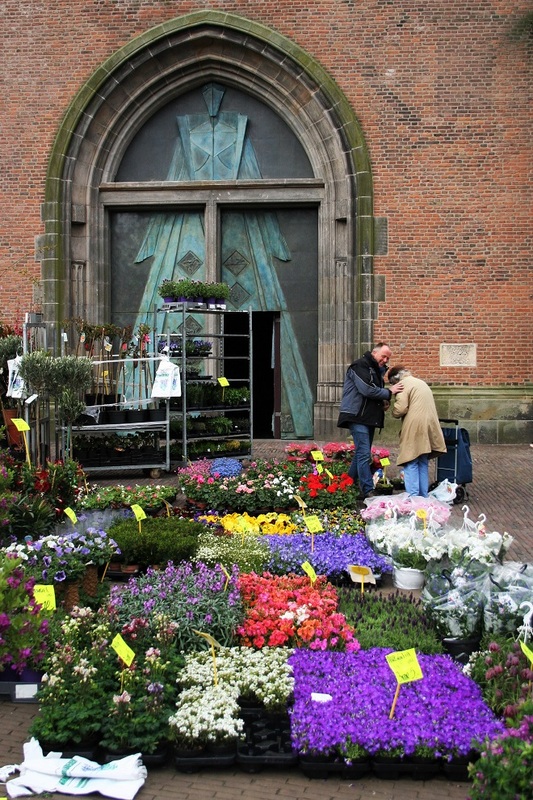 Are you wondering what seasonal flowers are available at the market in May? Why won’t you join me and visit the flower market? Let’s take our bikes and cycle to the old city centre. Whatever your favourite flower is, I’m sure you will find it here. 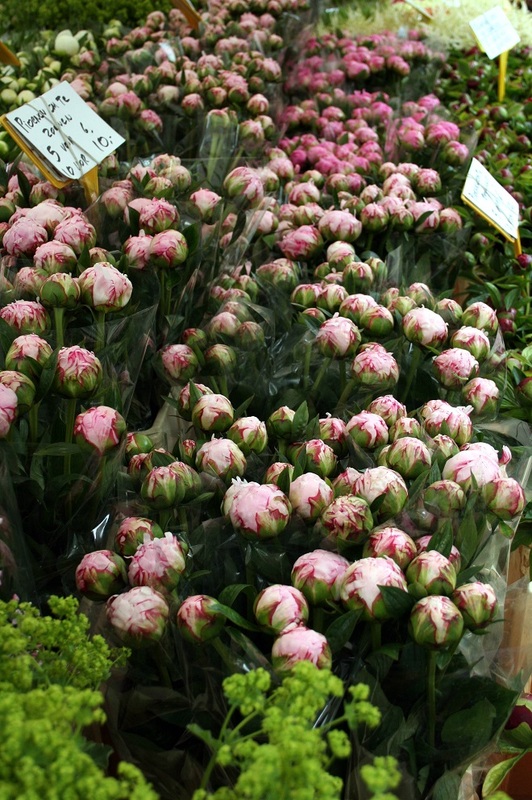 I’m always looking to buy seasonal flowers and hurray, it’s peony season! The best thing about a holiday is that you finally get to read all the books that have been piling up on your nightstand. I love to read, but find myself reading less and less. As a mother of four, there is always something to do and these things, or persons, always seem to need my immediate attention. So when we went on a holiday to Rhodes, the sunshine island in the Aegean sea, I not only packed holiday essentials such as summer dresses, sunglasses, and bikinis, but also a stack of books. My boys need lots of food, and they love to swim. We stayed in a hotel with a swimming pool and a breakfast and dinner buffet with great food, so the basics were covered. 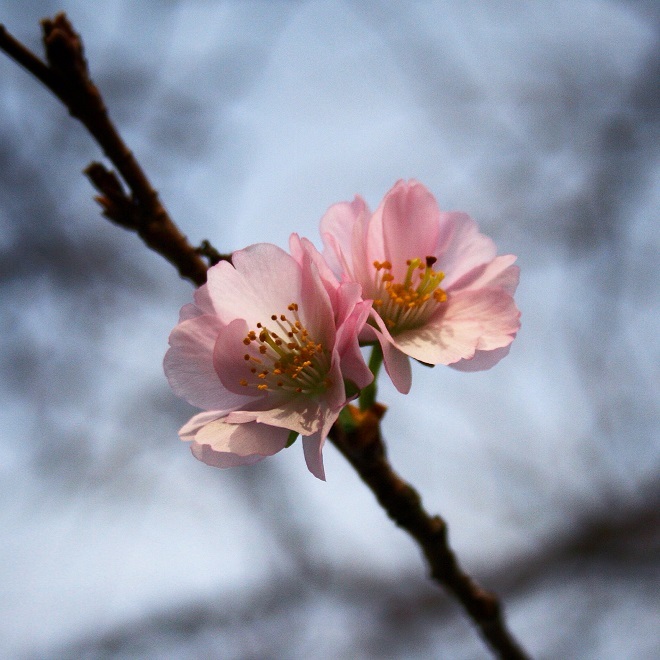 Is it spring where you are? If so, does it feel like autumn where you are? We have had a cold week, with rain and winds, thunder, lightning and even some hail. It really has been an unusually cold May. I went to the market this morning. The vendors were complaining and ordering soup from the lady with the coffee and soup cart. 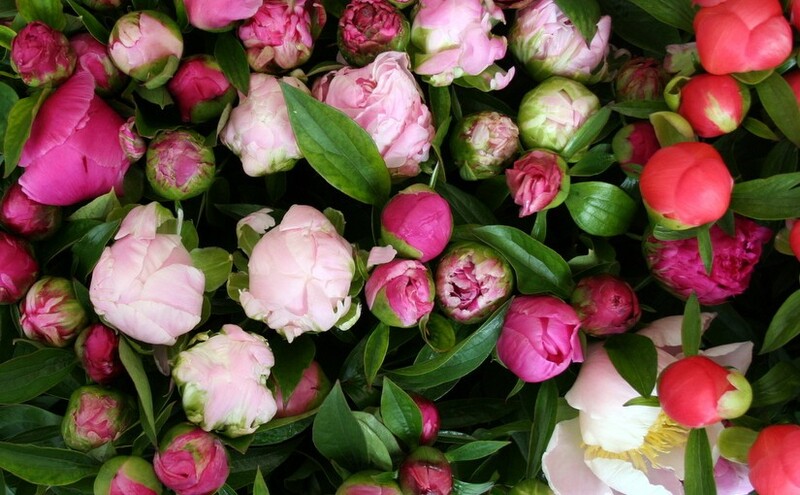 I bought peonies! If you’d like to see them, have a look at my Instagram account. On such chilly, grey days, it feels like we have skipped summer altogether and it’s autumn all over again. 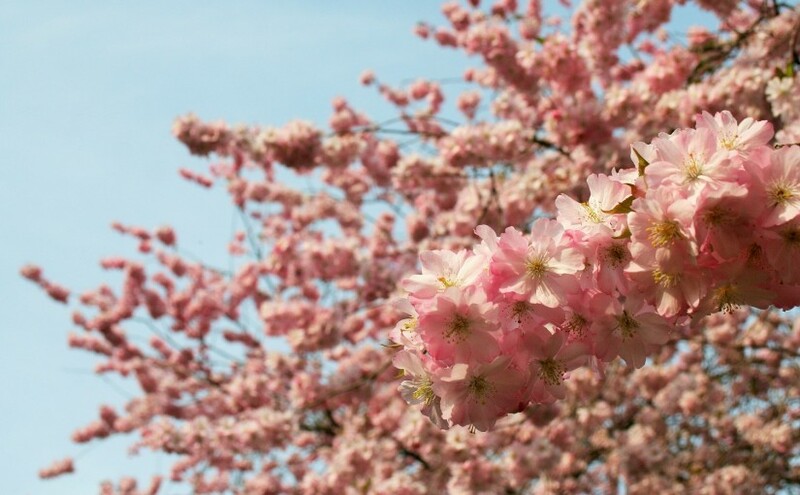 To remind us that it is, indeed, spring, I thought it would share my top 3 spring blossom trees. Three weeks ago my friend Bex nominated me for a Liebster award. The Liebster award is all about discovering new blogs to follow, so I was very happy to pass it on to three newer bloggers whose blogs I love. As a flower lover and aspiring gardener, of course, I chose my nominees among like-minded flower enthusiasts. 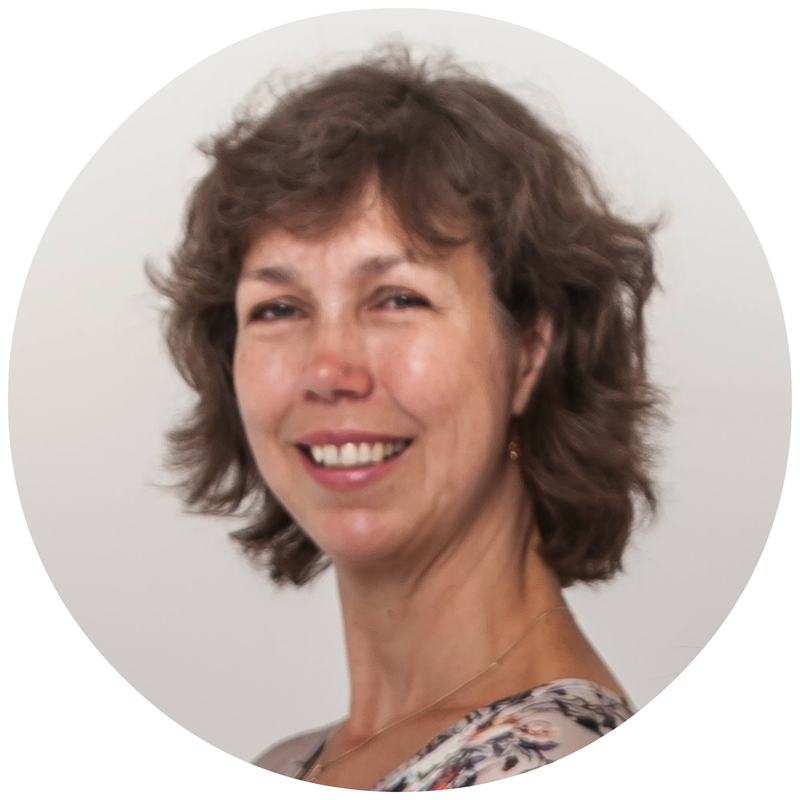 One of the bloggers I would like you to discover is a fellow countrywoman, Marieke Nolsen. 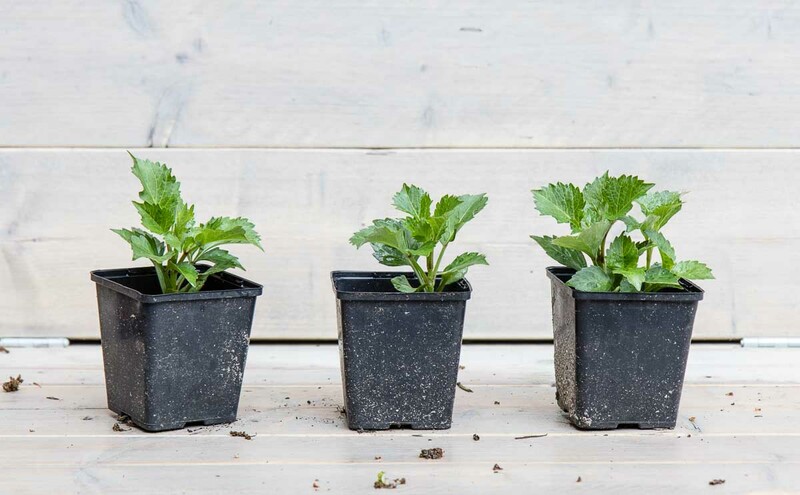 She is a florist and a gardener with a lush floral blog. 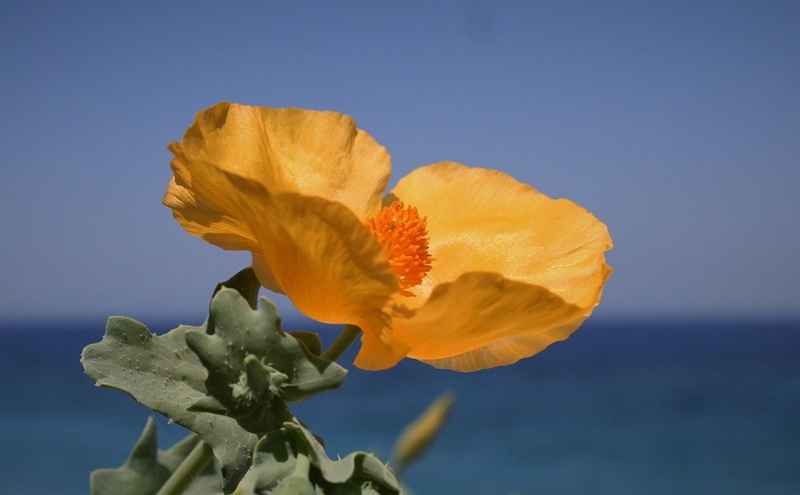 She doesn’t have much time to write, but she shares lovely pictures of her garden flowers. 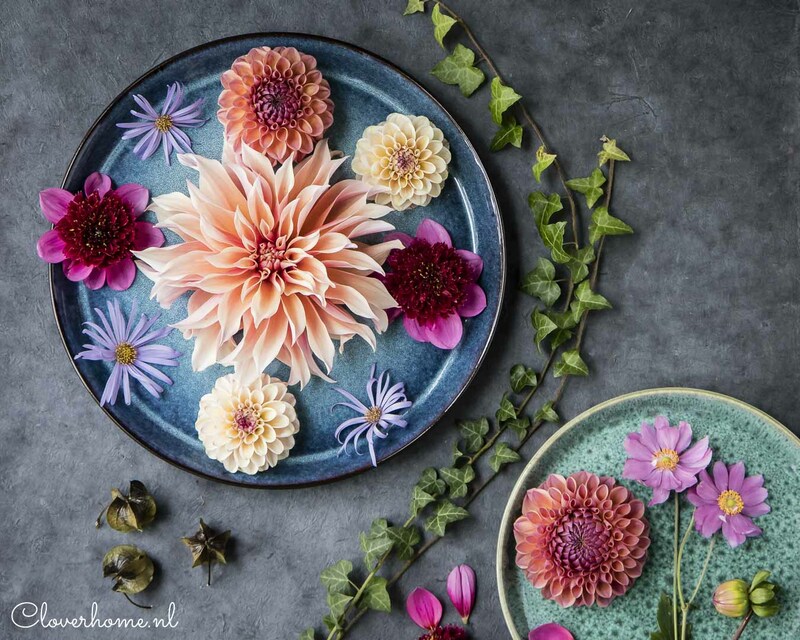 I especially love the collages she creates, with pictures of yellow and white spring flowers, different kinds of small purple flowering plants, or a variety of purple pansies. She really has an eye for colour and a distinct style. Violas are her favourites. I told you in my market days March how people are anxious to get some colour in the garden, they can’t resist the happy faces of the pansies. This lady certainly didn’t hold back! 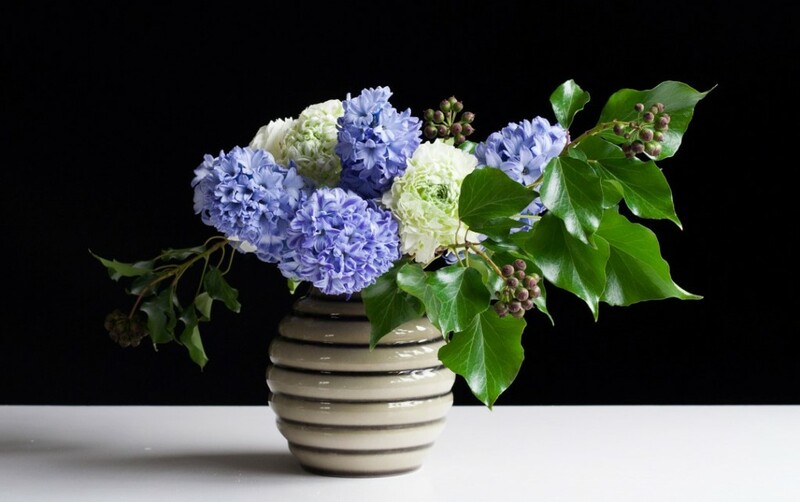 Marieke hosts floral workshops using seasonal flowers, preferably from the garden, creating natural floral arrangements. 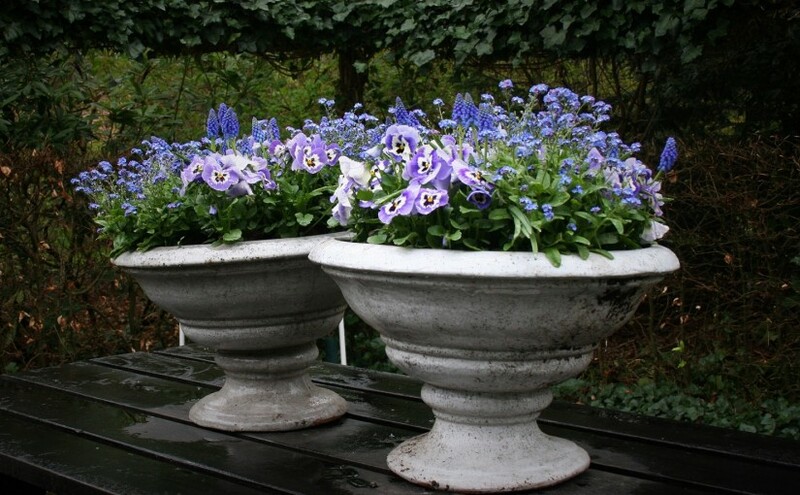 She also has a passion for gardening and gardens as she arranges flowers or vice versa. I would love to join one of her workshops one day, I definitely need to practise my flower arranging skills, but for now I had to settle for a visit to her garden. Marieke lives in an old farmhouse that used to be part of an estate, Den Treek. The estate consists of woodland and heather, it’s very popular at weekends. We like to take the kids there for a walk or even a picnic in summer. 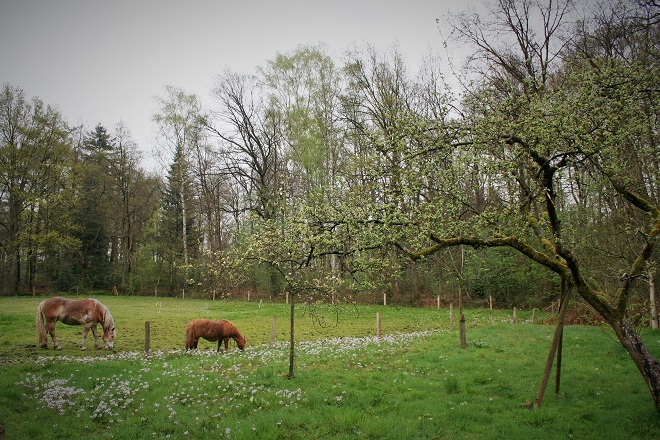 The garden surrounding Marieke’s house is divided into four ‘rooms’ each with a separate identity. The garden was designed to fit the characteristic farmhouse, the flowering plants carefully selected to match the colours of the house. The garden consists of several flower beds, full of perennials and shrubs. Because she loves to work with fresh-from-the-garden material these are mostly flowers and foliage for cutting, like crab apples and hydrangea. 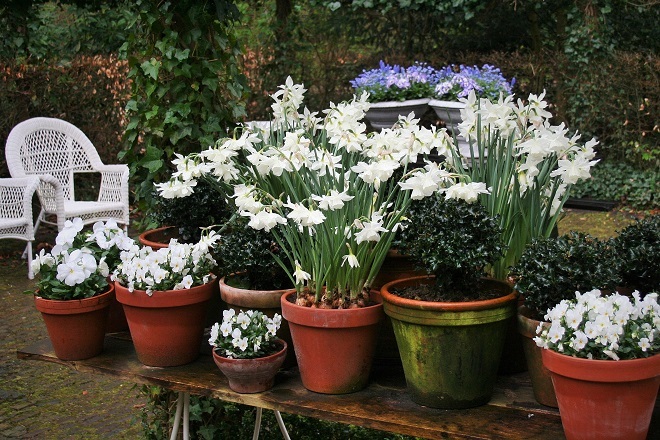 Last autumn Marieke went to a visit a large flower bulb grower and exporter. The flower bulbs were reasonably priced, she just couldn’t resist them and bought 1500 bulbs! It took two days to plant all the bulbs in the garden beds. Several times a year the garden is open to visitors. 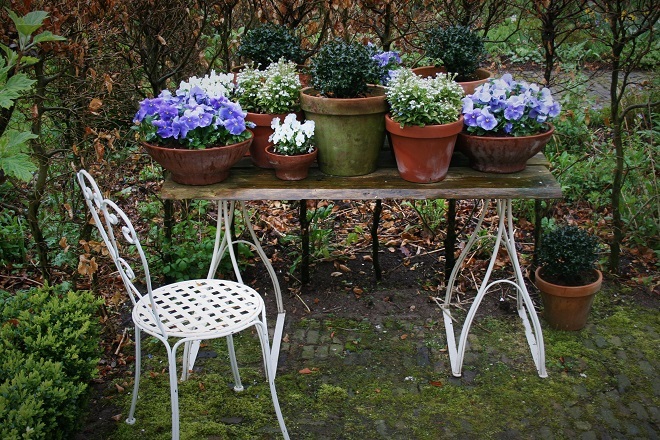 Marieke, of course, was anxious to have the garden ready for spring. She was hoping for flowers beds overflowing with tulips and visitors enjoying the bounty of spring bulbs. But, of course, you can’t fight Mother Nature. This spring has been unusually cold and dry. As a result, blooms were about a month late. Only a few of the 200 tulips or so that were planted in autumn started blooming. Did they suffer from the cold, or did the voles (woelmuis in Dutch) get to them? These are the sorrows of gardening. Despite these sorrows, there was still plenty to enjoy. The tulips that were in bloom, were beautiful, with large flowers on sturdy stems. 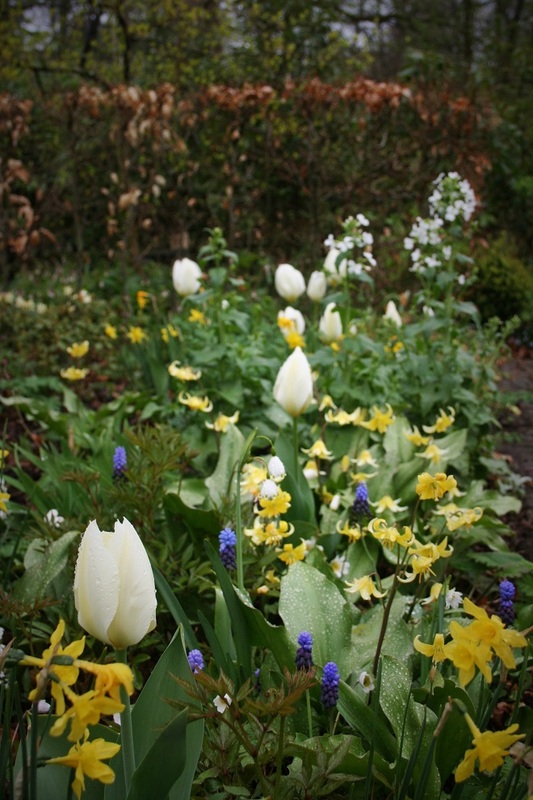 The combination of daffodils, white Lunaria, Muscari and yellow aquilegia in the front garden perfectly matches the white and soft yellow of the house. 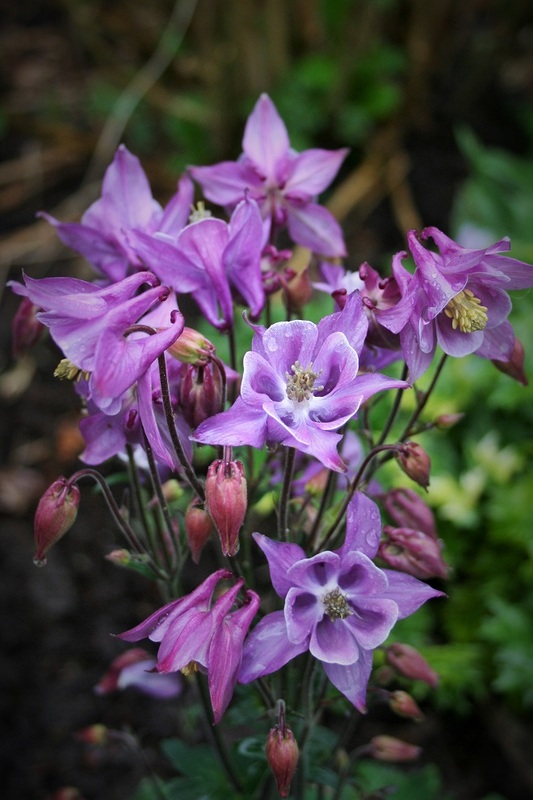 The aquilegia was planted to fill the gaps of the missing tulips. In my garden, it doesn’t bloom just yet. 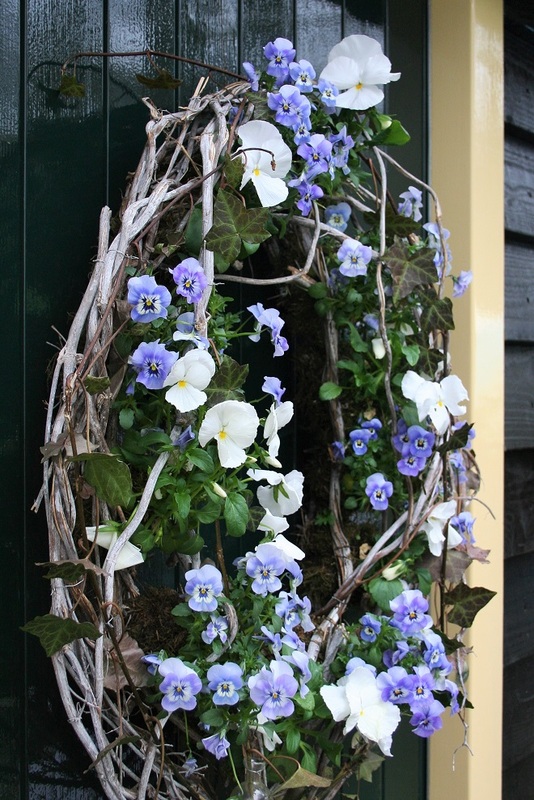 The pots filled with white pansies, narcissus (Thalia) and dark green, almost black, holly made a very pretty picture. I hope you enjoyed this garden tour as much as I have. 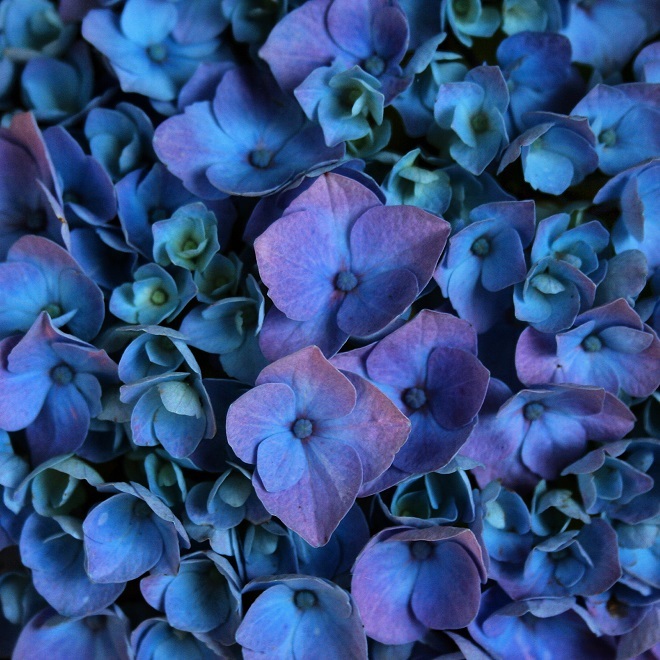 I can’t wait to visit it again in summer and see the hydrangea in bloom! I promise I will take you there again. Today being the last day of April, I hope to see you again next week for Market days April. We have a king, a queen and three lovely princesses. The queen likes to dress her girls in matching outfits, just as my mother liked to do when me and my sisters were little. I can’t remember whether we loved it or hated it. I do know that as soon as my eldest sister got to choose her own clothes, she wouldn’t wear a dress anymore. But enough about me and my childhood memories. It’s King’s day next week! King’s day is a national holiday when we celebrate our king’s birthday. It’s one of my favourite holidays because of the relaxed and friendly atmosphere. The Netherlands is a small country and we celebrate this day in a typical Dutch manner. There are no military parades, but children decorate their bikes for a neighbourhood bike parade. There are festivals all over the country and flea markets in many streets. City centres will colour orange because our royal family is from the House of Orange. We will celebrate King’s day in our own neighbourhood. The neighbourhood committee (we are very well organised) is hosting a coffee. We will drink ‘oranjebitter’, a liqueur made from oranges, and toast to the king’s health. There is no dress code, but a touch of orange is appreciated. With spring, the sun shining and a holiday coming up, I think there are enough reasons to make ice pops. To stay with the theme I’m making orange ice pops but I like to add a lime for extra fresh flavour. Start by washing the fruit. Next, cut the oranges and lime in half and squeeze out the juice. Make sugar syrup by heating 200 ml of water and 100 grams of sugar in a stainless steel saucepan. Stir with a wooden spoon until the sugar dissolves. Cut the fruit peel in pieces and add to the saucepan for extra flavour. Boil for a few minutes. Then remove the fruit peels from the pan. Add the sugar syrup to the juice and let it cool in the fridge for a couple of hours. The colder before freezing, the better. Stir again before pouring into the ice pop mold. Put in the freezer overnight. Remove the mold from the freezer, run warm water over the mold for 10 seconds, pull the pops out, and enjoy. What’s your favourite holiday, and does it include any orange clothing?